Today instead of taking a cab downtown, I decided to dust off the bike. I probably haven't ridden it in at least ten years, but the tires pumped up nicely and with a slight wobble I was off. My helmet is admittedly antique. I didn't take any pictures going downtown, but it was very muddy along the river, and complete gridlock south of about 88th Street. I had already resigned myself to being very cautious, but I was gritting my teeth the entire way as cars and pedestrians and bikers all threatened at various points to swerve in front of me. Biking around the city is like being a landlord: you can't do it for very long and expect to maintain a glowing opinion of the intelligence of your fellow humans. I didn't help that my toe clips were broken, and running shoes are difficult to slide over the pedal, due to the bumps and ridges on the bottom of the sole. I took a picture of the broken crane on my way home. Central Park West was an insane parking lot until about 80th Street. Harlem was relatively quiet, however, and I stopped to enjoy the gothic architecture at City College in Hamilton Heights. Dream brownstones on Convent Avenue in the low 140s. Convent Avenue blissfully free of traffic, which isn't to say you can ever let your guard down in the city; someone on a cell phone walked right in front of me about ten seconds after I took this picture. After watching the trees bend and strain against the wind last night, we felt lucky to have escaped any significant damage to the garden. We lost a handful of bamboo stalks and a few small branches, but really nothing to speak of, especially compared to elsewhere. The wind gods were merciful to our trees, at least. They did not take so kindly to some construction fencing at the house next door, however. We decided to go for a walk; most of the neighborhood seems to be relatively unscathed, no doubt a result of being safely above the storm surge. There was more damage around Jumel Terrace, where there are many old trees. The northeast corner of the park. Thankfully the 200 year old English Elm on Saint Nicholas and 163rd Street -- one of the oldest and biggest trees in the city -- seems no worse for the wear. We walked west, and discovered that other trees on Riverside Drive were not so lucky. Several barges were anchored in the Hudson, where they had presumably waited out the storm. The sky continued to be dramatic. The George Washington Bridge remained aloof and impervious to all weather. We lesser beings felt very fortunate and sent good thoughts to those still dealing with the aftermath of the storm. When I got back from DC on Saturday, i spent some time in the garden picking up the leaves. They were covering everything, as they will do at this time of the year. When I started to pick them up, Stephen suggested I wait until after the storm, since there are still many more leaves on the trees than on the ground. I saw his point, but I couldn't resist cleaning up a bit. In times of uncertainty, it can be soothing to concentrate on something mundane. Of course I did more than concentrate: I fantasized about becoming a professional leaf remover, thus combining my passion and my talent into a financially rewarding career. Regrettably, I don't think there are many careers that involve picking up leaves by hand in small gardening spaces. Or if there are, they probably don't pay very well. Still, there's something to be said for knowing what you're good at, and what you're not, even if it's just picking up leaves. Even if it's a skill that doesn't exactly have a lasting impact, as I learned this morning when I went back into the garden and saw what the early winds of the approaching hurricane had done. Stephen was right, in other words. But as I thought about picking them up again, I realized that so was I.
I left behind the murky skies of New York City for the cobalt bliss of Washington, DC, where it felt like a hypothetically perfect summer day (but not an actual summer day, or at least not in DC, which is usually mind-numbingly hot). I could see the cold, imperial monuments of the modern empire rising above the horizon across the river. To my left, CIA operatives were meeting in parking lots with their informers. Or so it was easy to imagine, since I've been watching the award-winning, cable-television drama about CIA operatives and their informers, which is set in DC. As we crossed into the city, the splayed magnificence of the clouds contrasted with the restrained form of the bridge's balustrade, a perfect representation of the many contrasts I expected to encounter in DC. Mitt Romney was holding a sparsely attended rally in the back of the Lincoln Memorial. We passed the Mall, where I used to play pickup soccer every Sunday when I lived in Dupont Circle twenty years ago. One of the best players was from somewhere in the Middle East, and I remembered being impressed that he drank no water during Ramadan, not even a sip. Since this was a decade before 9/11, such behavior was not linked in our nation's collective consciousness to terrorist activity. After checking in to my hotel near Dupont Circle, I took another cab to the site of the conference I was attending for work. The conference hotel is part of a chain that caters to a more corporate clientele, which was apparent in the polished marble of the lobby, and the mysterious glowing obelisk to which all Fortune 500 board members must secretly pay tribute, sometimes with human sacrifice. The grounds of the hotel were decorated with more annuals than I would probably choose if I were the landscape designer, but it was difficult to find anything wrong with the trees, all of which were lovely. I bought a fare card from the most complicated vending machine in the world, and took the Metro back to Dupont Circle. The Metro in DC is also noteworthy for having the scariest escalators in the world. Back at my hotel, I admired the courtyard garden where in a few hours I would have dinner with my cousin. I felt almost manipulated by the non-corporate aesthetic of the hotel; it would be impossible to be a sarcastic curmudgeon while I stayed here. The hotel is filled with nooks and staircases, all of which resonate with the same 19th-century appeal as the townhouses lining the streets of the neighborhood. It took me approximately 30 minutes to find my room, which would have annoyed me except that I was comforted by the lack of corporate efficiency. The room exuded the same old-world charm. I want pocket shutters in every window going forward! The tiling around the fireplace was original; the artwork above the mantle portrayed a lesbian couple at the beach. I spent a few minutes wishing that this room would magically transport me back to the late 1800s, ignoring the many social ills that plagued that era, not to mention the lack of internet or television. The next morning, I arrived at my conference at 7:00 am. The marigolds were already awake and gossipping heatedly about Hurricane Sandy. The day passed in a blur of economic productivity, after which I returned to Dupont Circle on the Metro. I amused myself on the eternal escalator by creating optical illusions; here, for example, we are looking up, not down. As I walked through Dupont Circle and admired the row houses, the gardens, and the many non-heterosexuals wearing the exact business casual attire as me, I felt some nostalgic regret at having ever left this enchanted neighborhood for what struck me (at least at the most superficial level on which my thoughts were clearly operating) as a much harder existence in New York City. Dupont Circle seemed to resonate with a lack of pretension that was entirely different than say, Park Slope, the Brooklyn neighborhood it most resembles architecturally. Washington, DC is a city of reserved, well-mannered intellectuals, the kind of people who make jokes about "Jeffersonian democracy" (as I overheard while making my way through the lounge of my hotel) not the kind of place where everyone wants to be a famous artist. At some point in my life I was presented with a choice: did I want to live with my own kind, or did I want to go into exile? Given that I chose the latter (albeit unconsciously), I tried to enjoy my time with the former. I floated in to the Tabard Inn. I passed through the restaurant en route to the secret staircase by which I accessed my room. The staff was busy preparing for the evening rush. I longed for a skylight in which I would place a series of hanging ferns that as a result of the surrounding decor would come as more Victorian (albeit with a tinge of irony) than 1970s. Clearly a conundrum of the modern era is the need for a kind of mass production that brings with it a fatigue regarding the idea of consuming anything, or at least anything mass-produced. I called Stephen and suggested that he sell our New York City residence and immediately bring himself and our three cats to live at the Tabard Inn. The pocket shutters in my room glowed with an almost sadistic perfection. I tried to enjoy it, however. As I looked outside, I tried to imagine a world without cars. Back on the street, on my way to a work-related dinner, it was easier to imagine a world without windows, or at least a building in Dupont Circle where all the windows had been sealed for reasons I couldn't begin to imagine, and probably didn't want to, at least this close to Halloween. If I were a saint and owned a court, this would be my sign. The sun beckoned through the russet leaves of a nearby maple. The next day at the conference hotel, I wondered about the need for a model of the U.S. Capitol Building only a few miles away from the actual building. The day passed, and the Metro carried me between worlds. Soon I was back in Dupont Circle, imagining my life as a ghost in the Inn, where everything creaks as it should in an old townhouse. I couldn't stay long, though, because I had another meeting in Georgetown. As I walked east, I realized that the brick and slate sidewalks of Washington DC are ones that I unconsciously mimicked in our New York City garden. Washington also has the ideal climate for blue-atlas cedars, I sadly noted as I remembered the two deaths of the same tree species in our NYC garden. There are limits to what we can bring into the present from our past. The blooms of a very robust rose bush glimmered in the fading light. A statue of a cat adorned the top of a pillar in front of this perfect townhouse. Someone was leading my idea of perfect life, apparently! I was passed by a man who was dressed exactly like I was: off-white chinos, blue button down, brown belt, boat shoes, black jacket (carried in right hand), envelope in left. I followed him through a work function at which a single dancer jerked back and forth on the sidewalk. There was also a man on stilts. I felt relieved not to have been invited to this party; I also began to remember why I had left DC. A poster proudly/sadly proclaimed the imminent arrival of another upscale/bland hotel. I headed west toward Georgetown. Sometimes I wonder if New York City will ever get these bikes. Part of me wants them, but part of me is proud of the fact that we are too dysfunctional to treat them with the necessary respect. New York City used to have quaint little houses like this, too, but we replaced them with skyscrapers. I wanted to live in a cute/expensive Georgetown rowhouse. Except not really. But sort of. I was ambivalent about Georgetown twenty years ago, which goes to show some things never change. Having arrived a few minutes early for my meeting, I decided to visit a nearby bookstore. I was pleased to note the presence of a few (British non-heterosexual) Alan Hollinghurst titles, but somewhat dismayed to note the absence of any works by Andrew Holleran, despite the fact that he has set some of his fiction in DC and despite the fact that "Dancer from the Dance" is the most important American novel of the post-war era (at least in my opinion); it basically weaves the non-heterosexual experience into the American literary tradition in the same way that "Beloved" does the African-American story, with the difference being that Toni Morrison (deservedly) won the Nobel Prize while Andrew Holleran seems to be criminally neglected. Admittedly, I was feeling a bit neglected myself, on account of 1) the bookstore not having "The Metropolis Case" on its shelves, and 2) a recent blog post called "Elegy for a Grey (sic) Cat" I had read on a leading literary fiction site in which the author had posed the question: “For grief there’s 'A Year of Magical Thinking,' for breakups there’s 'A Girl’s Guide to Hunting and Fishing,' but what could I read when I lost my cat?" 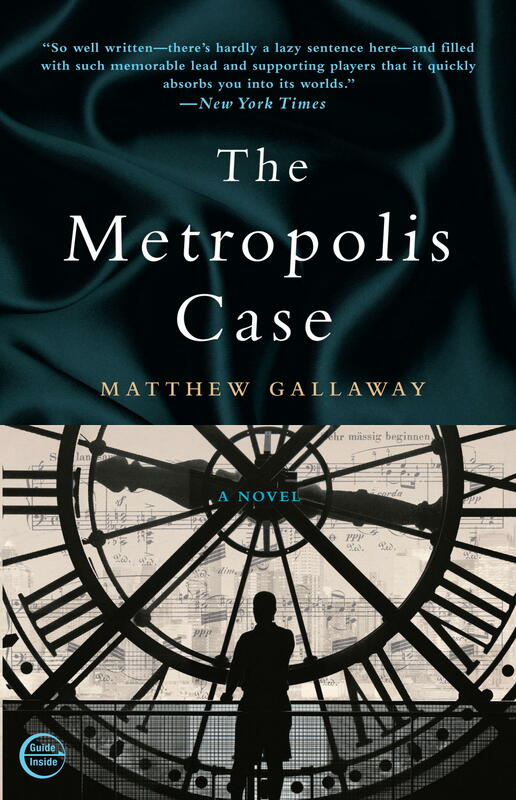 I didn't blame the writer of the post for not having read "The Metropolis Case" -- which has a very significant plot line about the loss/death of a gray cat, meant to illuminate the character in question's nascent abilities to grieve and love -- but I did feel a little sorry for myself, in the way we sometimes do when we create a product to meet a demonstrated demand, but when for whatever reason a failure in the marketplace means that our product does not reach its intended audience. In short, I didn't think anyone had written like I had about the death of a gray cat, and I wanted credit! I knew I was being ridiculous, however, and so I mentally moved on to a different topic. As I often am, I was placated by thoughts of gardening. A few minutes later, I arrived in the coldly ornate lobby of a luxury hotel, where in the adjacent bar I enjoyed a business meeting and several celebrity sightings, where "celebrity" is defined as "reality television contestant." On my way back to my hotel, I stopped to say hello to the moon, which was shining through the leaves of my favorite red maple. The next morning, on the way to the airport, I was again struck by the non-industrial landscape of Washington, DC. I'm not saying it isn't beautiful or artistic. I was ready to get back to New York, which though 100-percent more abrasive than the areas of DC where I had recently been admiring (and I understand that not all of DC is a rich, non-heterosexual enclave, but it was easy to pretend), is driven by creation and chaos, as opposed to order and analysis. New York is unfathomable, even or especially when viewed from a distance. If I could just maintain my focus -- as the billboard obnoxiously told me -- I might be able to write a book that would get into the hands of those most predisposed to read it. The cab driver had no idea where we were going as we sped through the Bronx. I pointed to a yellow bridge crossing the East River into Washington Heights and told him that if he would just be patient, I would show him how to get there. It's been a lovely month in the garden, which is just starting to change color. Or some it has changed, in any case. The only bad thing about this month is that it gets dark too early to bring the cats out for their daily afternoon walk. (Notice how they've already disappeared from the below picture.) Like the rest of us, I supposed, the cats will just have to bide their time until the light returns in spring. Until then, unlike the rest of us, they will be napping that much harder than usual. Did you know that the album Free to Be You and Me was released forty years ago his fall? Neither did I until I happened to read an interesting piece at Slate about how the record was made. My mother bought it for me when it came out, and it was one of my favorites as a kid; I think it was perfectly done, in that the storytelling was in no way imperiled by the political message, which if you've ever tried to do something similar you'll recognize is a lot harder to pull off than it seems. Thinking about it today, besides making me feel somewhat dated, I was reminded of how one of the good things about the 1970s was the way popular records such as Free To Be You and Me challenged gender stereotypes in ways that (at least in my memory) feel almost beyond us now, in an era of "girly girls" and whatever the opposite of that is. As the article points out, it's indisputable that society has changed quite a bit in forty years; more women hold higher-paying jobs, and girls -- at least those found in progressive/politically liberal communities -- probably have a greater sense of potential regarding what kind of lives they can lead. At the same time, as I ride the subway through more economically challenged neighborhoods and watch the teenage girls in their skin-tight jeans and the boys posturing in their (relatively baggy) pants and big coats, I can't help but think that we still have a long, long way to go before we as a society can claim to be released from the demoralizing effects of gender conformity. Or have you even watched television lately? It seems as though every prime-time star (ethnicity aside) is either a thin, athletic girl/woman with long, perfect shampoo-commercial hair, or a chiseled man with six-pack abs. That we are an intensely neurotic and judgmental society is hardly worth arguing about; clearly the need for a slightly modified/updated Free To Be You and Me II (ideally including sexual orientation with its gender deconstruction) is still great, but is an idea that would probably not in a million years get "green-lighted" by the executives who now run mainstream networks and record labels. In short, it would be a record that would be made by and for those who already appreciate its message, an exercise in preaching to the choir. Or we could just not worry about it and hum an old tune as we admire the sun streaming through the red leaves of Washington Heights, or the cobalt sky behind the Empire State Building. Even when you're inside, it's important to keep in shape by simulating flying-snake attack scenarios. For example: oh, what's that creeping across the floor? Like most creatures capable of flight, flying snakes are not always airborne. It's important to stay very still, as if you don't even see the impending snake attack, and then... Beat the crap out of that flying snake! If you do this forty or fifty times per day, you'll be in good shape when you're outside and the inevitable attack arrives. Sometimes in the middle of summer, we complain about our birch tree because it blocks quite a bit of sun from the plants on the ground. But at this time of year, when the flowers are all gone (except for the toad lilies), and the birch is still lush, we can't complain. Four years ago I think I was probably blogging more about political issues, whereas now I tend to focus on important things like architectural detail and the changing angle of the light as the seasons move forward. It's not that I won't be disappointed if Romney wins; it's more that the thought is so unbearable that I can't even begin to really address it in a contemplative manner. I want this blog to be more placid and reflective than filled with political histrionics. So whatever happens, let's be consoled by the idea that the beautiful, dilapidated buildings of Washington Heights are not going anywhere. Which is just one of many comforting truths. Here's another: there will be rain, but the skies will eventually clear, allowing the sun to shine. We've reached the time of year when night arrives very early. Usually the leaves have turned, but in the new global-warming era, the garden remains lush. Plants are nothing but opportunists, obviously. This might be the first winter where everyone keeps their leaves, which sounds like a great idea until you consider waking up to a very tired spring.